Jeff explores the prophetic fulfillment of Antiochus Epiphanes’ desecration, as written by the prophet Daniel, as well as the future Abomination of Desolation committed by the Antichrist. 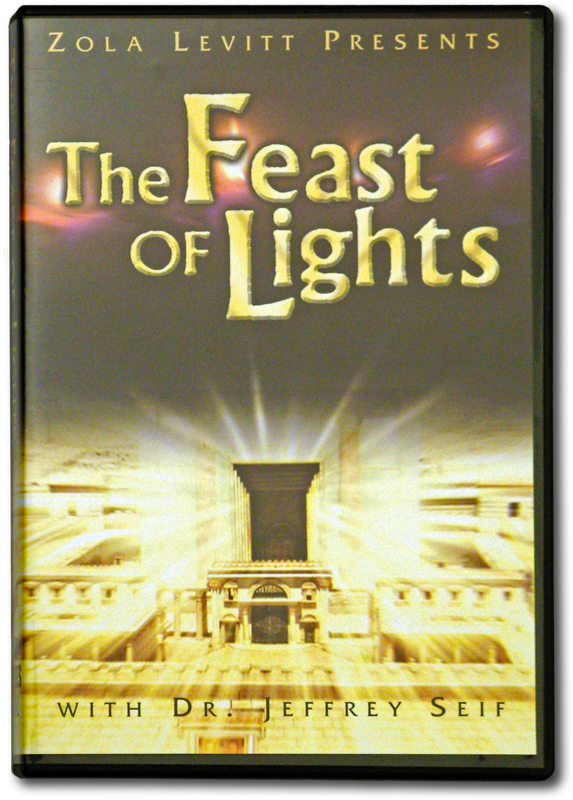 Discover the Feast of Dedication as observed by Jesus in the Bible, and don’t miss a heartfelt interview where Zola and Jean Rosenberg look at the celebration of Hanukkah in the home today. Since the dawn of time, forces of darkness have amassed and threatened the Jews with extinction. However, in every generation, God provided a leader who would shine the Light of God’s faithfulness. Hanukkah—the Jewish Feast of Lights harks back to a time when a cruel, anti-Semitic dictator threatened to wipe out the Hebrews. But the Lord’s Deliverer arose, lit the lamp of hope, and saved Israel. From generation to generation, Jews have lit lamps in their homes to commemorate the victory and retell the story of the Feast of Lights. 00:08 FORCES OF DARKNESS HAVE AMASSED AND THREATENED THE JEWS WITH EXTINCTION. 00:17 WHO WOULD SHINE THE LIGHT OF GOD'S FAITHFULNESS. 00:25 WHEN JUDAISM WAS THREATENED WITH EXTINCTION. 00:28 A HERO EMERGED, LIT THE LAMP OF HOPE AND DELIVERED ISRAEL. 00:52 TREATMENT OF THE JEWISH HOLIDAY CALLED "HANUKKAH"
01:00 ALL THE OLIVE OIL, WONDERFUL, WONDERFUL. 01:03 SO MUCH IN IT. 01:07 AND WE HAVE BEEN EXPLORING IT. 01:09 WE'VE LOOKED AT THE HISTORY OF HANUKKAH. 01:26 CONNECTS TO THE OLD AND NEW TESTAMENTS. 01:28 LAST WEEK WE SAW IT ALL HARVESTED. 01:30 THEN WE SAW IT PRESSED. 01:32 THE OLIVE OIL IS SO IMPORTANT IN THE FAMILY HOME. 01:35 WHAT IS OIL IN THE BIBLE? 01:36 WELL, THERE YOU GO. 01:44 AND HANUKKAH INDEED IS THE FEAST OF LIGHTS. 01:47 IT'S A FEAST THAT WE ALL DO WELL TO PAY ATTENTION TO. 01:50 AND OIL IN THE BIBLE IS THE HOLY SPIRIT. 01:56 WE HEAR ABOUT HANUKKAH, THE FESTIVAL OF LIGHTS? 02:03 AND NOW WE'LL CONSIDER SOME HOW IT'S USED IN THE HOME. 02:06 HOW IS IT USED? IT'S JUST LIKE US. 02:09 WE'RE GATHERED, WE GET PRESSED AND NOW WE GET USED. 02:13 AND OUR STORY CONTINUES. 02:27 AND SEE HOW OLIVE OIL WAS USED. 02:43 IT WOULD HAVE BEEN BROUGHT INTO THE HOME AND STORED IN LARGE POTTERY JARS. 02:58 WHICH HAD BEEN PLACED IN VARIOUS WINDOW SILLS AND NICHES AROUND THE HOME. 03:02 THE OIL WOULD BE POURED THROUGH THE SMALL ROUND OPENING ON THE TOP OF THE OIL LAMP. 03:13 WHICH WOULD HAVE THEN BEEN LIT GIVING LIGHT TO VARIOUS PARTS OF THE HOME. 03:18 JESUS HIMSELF MADE REFERENCE TO OIL LAMPS. 03:26 WHICH WOULD HAVE BEEN A PRACTICE IN THE FIRST CENTURY. 03:39 FUELED FROM THE FRUIT OF THE OLIVE TREE. 03:47 OIL. IT WASN'T JUST USED IN HOMES IN GENERAL. 03:58 THE HOLY HOUSE, THE TEMPLE IN JERUSALEM. 04:08 WAS PLACED A CANDELABRA, A MENORAH. 04:24 AFTER DAY AFTER WEEK AFTER A MONTH, ON AND ON INTO THE FUTURE. 04:34 THE SYNAGOGUE CAME INTO VOGUE THE MORE SO. 04:37 AND HERE IN SYNAGOGUES WE HAVE THE LIGHT ABOVE US THAT STILL BURNS. 04:46 WHEREIN WHICH ARE PLACED THE TORAH SCROLLS. 05:08 THE WORD SAYS A NUMBER OF THINGS THAT ARE PREDICTIVE AND PRESCRIPTIVE. 05:17 WHAT WILL BE HAPPENING IN LIFE AS IT IS LIVED. 05:20 I'M LOOKING HERE AT A HANUKKAH STORY THAT WAS TOLD IN ADVANCE ACTUALLY IN THE BOOK OF DANIEL. 05:40 ANTIOCHUS EPIPHANES IN ANTIQUITY. 05:44 HE WAS KNOWN AS THE ONE THAT DESECRATED THE HOLY PLACE. 06:27 ONE WOULD COME WHO WOULD ENTER THE HOLY PLACE AND DESECRATE IT. 06:40 TAKEN THE TEMPLE, GONE INTO THE HOLY PLACE AND THERE HE SET UP A SHRINE TO ZEUS. 06:53 HE NOT ONLY DID THAT, HE MADE IT AGAINST THE LAW FOR JEWS TO BE JEWS. 07:02 OUTLAWED WAS SATURDAY OBSERVANCE OF THE "SHABBAT", THE SABBATH. 07:07 HE DID EVERYTHING HE COULD BY RULE OF LAW TO BREAK IT ALL DOWN. 07:21 AND HE WOULD SET UP THIS HEINOUS ABOMINATION WHICH MAKES DESOLATE. 07:33 IS BECAUSE JESUS HARKS BACK TO THIS STORY. 07:42 IF YOU'LL TURN THERE WITH ME, THIS IS A VERY FAMOUS TEXT AS WELL. 07:46 IN MATTHEW CHAPTER 24 JESUS IS SPEAKING TO HIS DISCIPLES ABOUT THE WORLD'S END. 07:55 TELL US, WHEN WILL THIS BE? 07:57 AND WHAT WILL BE THE SIGN OF YOUR COMING AND OF THE CLOSE OF THE AGE? 08:39 IT'S A VERY FAMOUS EXPRESSION AND IT'S IMPORTANT FOR A VARIETY OF REASONS. 08:44 IT SHOWS THAT THE HANUKKAH STORY IS TO BE KEPT ALIVE, IT'S NOT JUST RELEGATED TO DAYS GONE BY. 09:26 BECAUSE JESUS INFORMS THAT ONE LIKE ANTIOCHUS RISES UP AT LAST DAYS. 09:40 AND WITH ALL OF THAT THIS PERSON THEN MAKES THIS ABOMINATION WHICH MAKES DESOLATE. 09:51 HE'S TALKING ABOUT THIS ANTI-MESSIAH, THIS ANTI-CHRIST. 09:56 AND WHAT DOES HE DO? 10:05 THAT HE IS GOD." 10:09 HE JUST REENACTS THE RITUAL THAT ANTIOCHUS HAD SET IN MOTION YEARS AGO. 10:14 I THINK WE NEED TO KEEP AN EYE ON PROPHECY.WE NEED TO KEEP AN EYE ON ISRAEL. 10:19 WE NEED TO KEEP AN EYE ON WHAT GOD IS DOING IN THE WORLD.WE NEED TO KEEP AN EYE ON ISLAM. 10:40 ON OCCASION AS WE WALK WITH THE LORD AND SEE HIS WILL AND WAYS MANIFESTED ON EARTH. 10:55 DANIEL SPELLS IT OUT PRETTY CLEARLY. 11:00 AND DESECRATES IT JUST LIKE ANTIOCHUS. 11:02 YES, IT'S SCARY STUFF, IT'S SERIOUS STUFF ISN'T IT?. 11:08 AND YET FOR US AS BELIEVERS IT'S NOT ABOUT US. 11:10 IT'S REALLY ABOUT THE UNBELIEVER. 11:14 AND THE OTHER HAND IT'S GOOD NEWS. 11:17 THIS IS WHAT'S GOING TO HAPPEN. 11:18 GOD'S LEFT THE WORD TO UNDERSTAND WHAT'S GOING ON. 11:37 BECAUSE OUR REDEMPTION DRAWS NEAR. 11:42 SO THAT WE CAN SEE EXACTLY WHAT'S GOING TO HAPPEN. 11:44 NOTHING NEW UNDER THE SUN. 11:46 THAT'S RIGHT. AND JESUS IS THE ONE TO SHOW US THE WAY. >>RIGHT. 11:56 AS HE CELEBRATED HANUKKAH IN JOHN CHAPTER 10. 12:01 THE LANGUAGE OF BIBLICAL LITERATURE IS RATHER INTERESTING. 12:07 WRATH BEING POURED OUT. 12:13 WHEN I THINK OF GOD'S WRATH BEING POURED OUT I'M REMINDED OF THE STORY IN DANIEL 9. 12:18 IT TALKS ABOUT THE TRIBULATION PERIOD. 12:20 THE BIBLE PREDICTS A WORLD GOING DOWN INTO A NADIR; THAT IS TO A LOW POINT. 12:36 AN ANTI-MESSIAH WHO DECEIVES THE WORLD. 12:44 AS AN ANGEL OF LIGHT. 12:45 IN FACT, THE WORD "LUCIFER"
12:51 AND SO IT IS HE COMES WITH BRIGHT IDEAS. 12:58 EXCEPT THERE ARE SOME THAT RESIST, I MIGHT ADD. 13:01 JEWISH PEOPLE COME TO KNOW THE TRUTH. 13:03 THEY'RE NOT GOING TO WORSHIP THIS FELLOW. 13:11 AND ENTERS INTO THE TEMPLE MOUNT BEHIND ME. 13:19 INTO THIS RE-FABRICATED TEMPLE AND DESECRATE IT. 13:23 THAT'S SOMETHING HE DID IN DAYS GONE BY. 13:39 TO GET BEHIND HIM TO THEN THROW OFF THE SYRIAN YOKE AND REDEDICATE THE TEMPLE. 13:55 HE DESECRATES A TEMPLE THAT'S BUILT ON THIS TEMPLE MOUNT BEHIND ME. 14:00 IT'S A TRAGIC STORY FOR A VARIETY OF REASONS. 14:17 AND GETS THE BETTER OF THE DAY IN THE WAKE OF WHICH WE HAVE A NEW HEAVEN AND A NEW EARTH. 14:45 AND IT'S A GREAT TIME TO DO IT AT HANUKKAH TIME. 14:52 WHERE IT IS HANUKKAH AND JESUS GIVES A LITTLE HOMILY, HE GIVES A LITTLE TALK HERE. 14:58 LET'S LOOK AT WHAT IT WAS IN JOHN CHAPTER 10 AND VERSE 22..
15:06 AND I TRUST YOU KNOW THAT THE FEAST OF DEDICATION IS HANUKKAH, THE FEAST OF LIGHTS. 15:40 THAT IN THE FIRST CENTURY JESUS CAME AND THE JEWS REJECTED JESUS SO JESUS REJECTED ALL THE JEWS. 15:48 NOW AT ONE LEVEL THAT'S REALLY BAD THEOLOGY. 15:55 BECAUSE ALL THE JEWS DIDN'T REJECT JESUS. 15:57 THIS STATEMENT REFLECTS A KIND OF POLARIZATION. 16:11 SOMEWHAT AMBIVALENT, NOT KNOWING WHICH WAY TO GO. 16:19 "TELL US WHO YOU ARE, WHAT YOU'RE ALL ABOUT. WHAT IS THIS?" 16:47 THERE WAS SOMETHING BEYOND HIM, THAT HE WAS MORE THAN A MAN, MORE THAN A CARPENTER. 16:53 THE MIRACLES TESTIFY IN AS MUCH AS THE HANUKKAH STORY. 17:00 BUT GOD GIVES THE ARMIES VICTORY OVER THE SYRIANS. 17:03 AND NOT ONLY THAT HE GIVES THEM A MIRACLE TO CELEBRATE WITH THE FEAST OF DEDICATION. 17:07 MIRACLES AUTHENTICATE GOD'S WORKING IN THE WORLD. 17:24 THAT YOU WOULD HEAR THE LORD'S VOICE SPEAKING TO YOU THROUGH HIS WORD. 17:50 AS A SHEPHERD WANTS TO LEAD YOU INTO A SUCCESSFUL FUTURE. 18:11 ASK FOR OUR FREE MONTHLY NEWSLETTER, THE LEVITT LETTER. 18:17 WITH THE LATEST VIDEOS, BOOKS AND MUSIC. 18:24 INCLUDES READING PACKETS, TEACHING CASSETTES AND MAIL-IN TESTS. 18:31 OR THE HOLY LAND EXPERIENCE THEME PARK IN ORLANDO, FLORIDA. 18:35 PLEASE CONTACT US FOR MORE INFORMATION. 18:41 "I SHALL STAND WITHIN THE WONDER OF YOUR WALLS OH JERUSALEM." 18:46 "I SHALL WALK WITHIN THE SPLENDOR OF YOUR GATES." 18:51 "BEAUTIFUL FOR SITUATION THE JOY OF THE WHOLE EARTH." 18:56 "SURELY THE LORD HAS BLESSED THEE AND MADE HIS FACE SHINE UPON THEE." 19:03 " COME TO ZION WITH SONGS AND EVERLASTING JOY." 19:18 YOU HEAR ME SAY, "THAT'S ISRAEL AND THAT'S THE WAY WE SAY IT." 19:22 AND IT'S KIND OF A TRADITION I'D LIKE TO CONTINUE ON. 19:24 THAT IS ISRAEL. IT'S THE WAY WE SEE IT. IT'S WHAT WE LOVE. GO TO ISRAEL. 19:29 AND TRADITION CAN BE GOOD. 19:37 WE CAN CARRY THE PAST ALONG NOW CAN'T WE? 19:40 I THINK SO TOO. 19:44 AND SHE WAS SO SWEET AND SO LOVELY. 19:46 SHE REMINDED YOU OF JUST THE OLD SWEDE, JEWISH LITTLE MAMMA. 19:52 YES, THAT YOU WANT TO JUST PINCH HER LITTLE CHEEK. 19:57 AND WHAT THE MEMORIES WERE FOR HER AND WHAT THE MEMORIES WERE FOR ZOLA. 20:00 I'D LIKE YOU TO WATCH THAT. 20:01 IT'S A WONDERFUL, WONDERFUL, SWEET INTERVIEW. 20:05 CAN YOU TALK ABOUT HANUKKAH WITH ME A LITTLE BIT? 20:07 HANUKKAH WAS REALLY, REALLY THE JOYOUS OCCASION. 20:11 WE KNEW IT AS CHILDREN AS A BIG THING BECAUSE OF GIFTS. WE WERE GOING TO GET GIFTS. 20:16 WE WERE GETTING A HANUKKAHGELT, WHICH IS... >>HANUKKAH GOLD. 20:19 HANUKKAH GOLD. >>CASH! (LAUGHING) FINE SILVER! 20:24 MAYBE IT WAS 10 OR 15 CENTS, I DON'T REMEMBER. >>YEH, RIGHT! 20:27 BUT IT WAS HUGE TO US AT THE TIME. 20:30 AND OF COURSE IT WAS THE GAMES WE PLAYED AND WAITING FOR THE LIGHTS. 20:42 BUT A BOY OR A GIRL COULD LIGHT THE CANDLES.IT DIDN'T MATTER. 20:45 SO ONE OF THEM, ONE OF MY BROTHERS OR SISTERS UNDOUBTEDLY DID IT. 20:50 AND THEN AGAIN WE CHILDREN WERE SENT TO "HAYDER". 20:54 THAT'S A JEWISH SCHOOL THAT WOULD BE IN THE SYNAGOGUE. A HEBREW SCHOOL. 20:58 WE CALLED IT JEWISH SCHOOL OR HEBREW SCHOOL. 21:00 IT WOULD HAPPEN RIGHT WHEN WE GOT OUT OF SCHOOL WENT DIRECTLY TO HAYDER. >>YES. 21:05 SOME LEARNED TO READ AND WRITE YIDDISH, JEWISH. 21:08 EVERY DAY BUT FRIDAY. 21:09 OH, NO NOT FRIDAY. 21:22 AND OUR PARENTS WOULD COME AND SEE THESE PLAYS PUT ON. 21:26 RATHER LIKE CHRISTMAS IS TODAY. CHILDREN PUT ON COSTUMES AND GIVE A PLAY. 21:31 REALLY IN THE SAME. 21:33 AND OF COURSE IN THE HOUSE THERE WAS SUCH JOYFULNESS. 21:37 IT WAS A JOYFUL HOLIDAY. WE KNEW IT.WE SENSED IT. 21:41 AND OF COURSE IT WAS NOT ONLY GETTING GIFTS, IT WAS GIVING. 21:45 JEWISH IS BEING CHARITABLE AND WE ARE TAUGHT CHARITY FROM THE BEGINNING. 21:55 WE KNEW IT WOULD GO INTO THE CHARITY BOX THAT WE HAD ON THE DOOR ALL YEAR ROUND. >>KUPPAH. 22:04 THE BAKING AND THE COOKING. ALL THE GOODIES THAT WE HAD. 22:13 MAYBE PEOPLE WENT BACK TO GET THE DATE FOR CHRISTMAS FROM THE INCEPTION OF HANUKKAH. 22:17 CURIOUS HOW THESE HAVE COME ALONG IN THE SAME WAY. 22:20 I DON'T THINK IT'S A COINCIDENCE DO YOU ZOLA? >>NO, I DON'T REALLY. 22:22 REALLY >>I THINK IT'S A COMMEMORATION. 22:25 A BIBLICAL FESTIVAL IS THE WAY TO PUT IT. >>RIGHT. 22:35 BECAUSE CHRISTMAS GIFTS WERE NOTORIOUSLY RETURNED (LAUGHING). 22:38 RETURNED GIFTS. NO, WE GAVE MOSTLY MONEY. 22:40 WE WOULD GET LITTLE BAGS OF NUTS, FRUITS, JUST LIKE THEY DO HERE. 22:44 BUT THE MOST THING WAS THE MONEY. 22:48 AND THAT TOO COMES WITH CHRISTMAS. >>ABSOLUTELY. 22:54 A SPECIAL EMPHASIS ON CHRISTMAS TIME. 23:00 THAT THEY HAD NOBODY TO COME IN TO SEE THEM, THEY WERE LONELY, WE WOULD MAKE A VISIT. 24:33 BEAUTIFUL MUSIC WITH A GREAT SERIES ON THE FIRST CHRISTIANS. 24:43 WHEN MORE JEWISH PEOPLE ARE COMING TO FAITH. 24:52 NOW SURFACES IN CHRISTIAN CONSCIOUSNESS AS THROUGH THE SERIES. 24:59 HANUKKAH'S A WONDERFUL EXAMPLE OF THE LIGHT'S BEAM THERE. 25:02 YES, JESUS SAID IN FACT THAT HE WAS THE LIGHT OF THE WORLD. 25:06 AND A WOMAN BRINGS IN THAT LIGHT OF THE WORLD. 25:09 YES, PASSOVER TIME A WOMAN LIGHTS THE CANDLES. 25:13 IN FACT HANUKKAH IS A HOLIDAY..
25:15 THAT'S WHY JEAN IS SO GOOD TO TELL THE STORY..
25:20 MORE THAN IN THE "SHUL", MORE THAN IN THE SYNAGOGUE. 25:22 AND IT'S A HAPPY TIME. IT'S A TIME TO REMEMBER. 25:28 THAT THERE ARE PEOPLE THAT NEED OUR HELP. 25:40 AND CELEBRATE THE FEAST OF LIGHTS AND THE FEAST OF DEDICATION. 25:53 AND BEING ABLE TO WITNESS TO OUR FRIENDS AND OUR FAMILY. 25:58 WHO WAS PRESSED AND SQUEEZED AND OUT CAME THE HEALING BALM? 26:03 YOU KNOW I THINK OF JESUS SHEDDING HIS BLOOD ON CALVARY'S CROSS. 26:25 AS A RESULT OF THIS PROGRAM TODAY. 26:28 JEFF, THANK YOU FOR THE TEACHING. 26:29 HANUKKAH IS A WONDERFUL, WONDERFUL HOLIDAY. 26:37 PRAY FOR THE PEACE OF JERUSALEM.